Entering the Vulcan Raffle 2019, helps raise valuable funds towards the care and maintenance of Vulcan XH558. 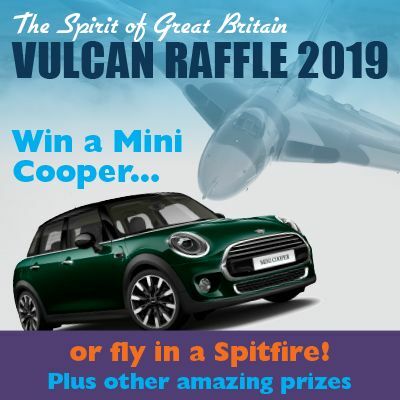 Established as an annual raffle with a reputation across the heritage aviation community for excellent prizes, the Vulcan to the Sky Trust Raffle 2019 builds on that reputation with five more incredible prizes that you can win for just one £2 entry ticket. You must be 18 or over to enter and a UK resident or a holder of a British passport. Please only select a MAXIMUM OF 10 TICKETS per transaction. Your uniquely-numbered tickets will be posted to you as your proof of entry -​​​ Please select 'RAFFLE TICKETS' at checkout. Discount voucher codes can not be used to purchase raffle tickets. Please see raffle website for full terms and conditions before entering. Fitted with a rain sensor, auto headlight activation, air conditioning, an on-board computer and a host of other equipment fitted as standard. There are also optional extras fitted such as sport seats, Yours Fibre Alloy Interior, cruise control with brake function and much more. See the Ts&Cs for the full specification. It will also be a rather special MINI because of one fascinating fact – it will be one of the last ever MINIs to come off the production line in this historically famous racing colour! The MINI is an iconic example of British engineering at its world-beating best, just like the Avro Vulcan. It was the ingenious decision of early sixties innovation to turn the engine sideways (transverse) and attach the gearbox on the side while incorporating front-wheel drive, allowing a far greater area of the floorpan for passengers and luggage. It’s a layout that has influenced car designers all over the world ever since. Although now remodelled as part of the BMW stable, it is still made at Cowley in Oxfordshire and retains styling cues and elements of British eccentricity much admired as a due homage to the original design. The car is already specified and allocated on the production line schedule, so will be ‘brand new’ - registered as a late 2019 model, coming to the lucky winner in early 2020 with just delivery mileage on the clock. A visit to the Boultbee team for two people at one of their operational bases throughout the country, with one passenger able to take a 30 minute experience in a WWII Spitfire in a flight profile of your choosing - sightseeing or aerobatics, or a mixture of the two. At one point you will take full control to truly say, “I have flown a Spitfire”. Operational bases are at Duxford, Exeter, Goodwood or Cumbernauld. Winner will be able to select which part of the country to fly from. Discover why Concorde at its time was the pinnacle of aeronautical achievement, an aircraft that had such power, speed and grace to become perhaps the most recognisable and loved machines ever to fly. This prize is a VIP trip for four people to Brooklands Museum in Surrey where a former British Airways Concorde captain will give a presentation on the history of this famous site, and of Concorde itself, before your party is led on a guided tour of Concorde G-BBDG. After a three-course lunch, each member of the party will then have 30 minutes at the controls of their Concorde Flight Simulator, the only one operational anywhere in the World! A remarkable and unforgettable experience! This is a tour for two people of the Renault F1 Team’s headquarters in Enstone, Oxfordshire, giving a rare and exclusive insight into the design and manufacturing of an F1 car. Advanced aerodynamics, engineering and manufacturing processes are used to maximise the performance of these machines. You will enjoy a privileged view of the challenge of developing, producing and eventually racing cars that lie at the cutting edge of technology. This is a ‘money-can’t-buy’ prize - a rare opportunity to see ‘behind-the-scenes’ at a naturally secretive highly advanced manufacturing facility. Note: Guests must not be connected to any competitor of the Renault F1 Team. This prize includes two nights’ accommodation at the Hilton Garden Hotel next to Doncaster Racecourse and, two Premier Enclosure Admission Tickets at the Leger Day festival on the Saturday with Champagne on arrival. An exclusive table is yours for the day, with a three-course meal and afternoon tea included. You will have a complimentary Raceday programme and access to an outdoor viewing terrace. After your second relaxing night in the hotel, take breakfast before travelling the short distance to Doncaster Sheffield Airport to enjoy an XH558 engine ground-run experience with the Vulcan team. Select any quantity from 1 to 10 tickets priced at £2 each. Declare your eligibility to enter by confirming you are 18 or over and a UK resident or a holder of a British passport. You then press 'Add to Cart'. We randomly select from a designated supply the covering number of entry tickets. Your name and address is recorded against the related stubs and these are entered to the draw. The corresponding counterpart tickets are posted to you for your records within approximately 10 working days of entry. If you have any queries relating to these tickets or you have not received your tickets within 15 working days, please call 01302 802077 quoting your order number. We will not accept more than £20 worth of entries at anyone time on the same order. Orders in excess of this (in any one transaction) will be declined and not processed. Any covering payment in lieu of any such excess order will be refunded to you. Multiple entries over differing days will be permitted - but reviewed ongoing. Excessive entry could lead to review of your individual web store account and customer contact. You are requested to provide a daytime telephone number at checkout for contact - which includes our random age verification check. All this is to comply with sensible guidelines to guard against habitual or problem gambling. If you wish to self-exclude your details from any future raffle or offers, then please email XH558raffle@vulcantothesky.org with EXCLUDE RAFFLE in the subject line and we will send you full details on how we can set this to your wishes. Registered with the UK Gambling Commission - www.gamblingcommission.gov.uk Licence No. 000-005127-N-306459-003. All entries will be governed by the Vulcan to the Sky Trust's code of conduct and social responsibility document which is lodged with and approved by the Gambling Commission.